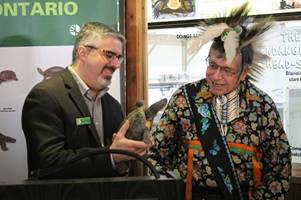 TORONTO, ON, Wednesday, March 28, 2018: The Toronto Zoo along with Parks Canada, Toronto and Region Conservation Authority (TRCA), University of Toronto Scarborough (UTSC) and the Ontario Ministry of Natural Resources and Forestry (OMNRF) are proud to announce an exciting new opportunity for members of our community at the Toronto Zoo. The new Blanding’s Turtle Exhibit is now open in the Americas Pavilion for guests of the Toronto Zoo to see and experience. This new exhibit offers a turtle’s-eye-view of one of the Toronto Zoo and Parks Canada’s most successful conservation programmes! One of the Zoo’s well-known head-starting programmes involves the Blanding’s turtles, a species that was about to disappear from the Rouge Valley, and now is being reintroduced into Rouge National Urban Park. Like the many other conservation breeding and release programmes at the Zoo, most of the work is done behind-the-scenes. Now, Zoo members and guests will have the opportunity to see these turtles firsthand in a new exhibit in the Americas Pavilion. This head-starting project was made possible with the support of many partners including Parks Canada, TRCA, UTSC and the OMNRF. This will be the fifth year Blanding’s turtles – listed as endangered by the International Union for Conservation of Nature (IUCN) and a provincially and nationally threatened species – will be released in the park. In June 2017, the same group of partners collaborated on the release of 49 baby Blanding’s turtles in the Rouge. The programme, which began reintroducing baby Blanding’s turtles in June 2014, has now reintroduced 116 baby Blanding’s turtles in total into the wild, and this number will grow to 165 as of June 2018. The Blanding’s turtle is a long-lived species, with a life span of up to 80 years, and has inhabited the Rouge Valley for thousands of years, though prior to 2014 its future was uncertain, with as few as six adult Blanding’s turtles remaining. These Blanding’s turtles were rescued as eggs from non-viable nests in a stable source population in southern Ontario and have been raised in a protected environment at the Toronto Zoo for two years. Giving these turtles a ‘head-start’ in life, the Zoo has raised them past their most vulnerable stages where they would otherwise have faced an increased chance of predation from animals like raccoons. The UTSC has joined this head-starting project and is assisting with long term monitoring of the released turtles. 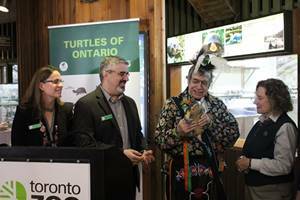 Parks Canada, the TRCA, the OMNRF, and the Toronto Zoo believe that this type of head-starting and reintroduction of the turtles, along with long term monitoring and ongoing habitat restoration, are keys to the species’ survival in the Rouge National Urban Park. CLICK HERE to report Native Frog, Toad and Turtle Sightings with the Adopt-A-Pond App! After extensive design, testing and tweaking, the Toronto Zoo’s Adopt-A-Pond Programme is proud to announce the official launch of a new citizen science app that will take our Turtle Tally and FrogWatch programmes to the next level! The Toronto Zoo’s Adopt-A-Pond Wetland Conservation Programme works to design and deliver impactful conservation-focused research, restoration, and outreach that highlights the importance of saving Canada’s sensitive wetland species and their habitats. This app is the next step in reaching out to engage more Canadians in protecting local biodiversity through citizen science. The Adopt-A-Pond App is fun and easy to use and, with you assisting our biologists, we can map where these threatened and endangered native species can be found. You can download this app through the IOS App Store and Android Google Play Store today! CLICK HERE to report turtle poaching, please contact Crime Stoppers. The Toronto Zoo and TRCA began collecting information on and monitoring Blanding’s turtles in the Rouge Valley in 2005. Environment Canada and the Ontario Ministry of Natural Resources and Forestry provided funding, permits and in-kind support for Blanding’s turtle monitoring in the Rouge Valley in previous years. With the area slated to become Canada’s first national urban park, Parks Canada has come on board and will continue to work on a long-term turtle monitoring program. 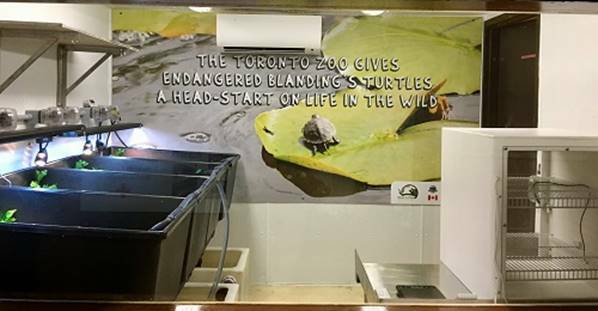 Earth Rangers, an environmental conservation organization focused on engaging youth in the protection of nature, also provided support for a facility to house the turtle eggs and babies at the Toronto Zoo. The Toronto Zoo is Canada’s premier zoo and a national leader in saving wildlife to ensure the rich diversity of nature for future generations. More than a tourist attraction, the Toronto Zoo boasts a number of leading programs for helping wildlife and their natural habitats – from species reintroduction to reproductive research. A world-class educational centre for people of all ages, the Toronto Zoo is open every day except December 25 and attracts approximately 1.3 million visitors each year.